We've been developing custom apps for more than 30 years and it's always exciting to see the space evolve. Now we welcome Google to the custom app neighborhood. The newest member of their cloud offering is called App Maker and just as its name implies, it is a platform for creating apps. Of course, we had to see what all of the excitement was about. We've actually been learning/playing with App Maker since it was released via Google's Early Adopter Program. Even before computers landed on our desks and laps, there's always been a need to organize information in a format that is both useful and productive. One of the first tools we all sort of gravitated to were spreadsheets. They are accessible, approachable and relatively easy to maneuver. However, as our requirements and expectations become more complex and demanding, we eventually find that those simple spreadsheets are unwieldy. So we ultimately end up at nearly the same place we started, looking for a way to consolidate, organize and present data efficiently and effectively. Software companies heard our cries of anguish and made attempts to rescue us with a variety of database products that are supposed to be helpful for end users. There are a raft of applications - some from big brands like Microsoft and Oracle as well as a myriad of niche software engineers - who have worked hard to bridge the gap between the intuitive nature of a spreadsheet and the organized but a little confusing aspects of a database. Many of these solutions worked well as long as we had a local desktop or laptop or better yet, a server machine to host the software. And this wasn't so bad as long as we could support an IT department that was either already well versed in the platform or had plenty of time on their hands to get acquainted with it. And then the cloud rolled in, bearing a bunch of new options that allow us to develop and deploy programs without needing a quote on hardware or installation of some software client on any of our user's machines. Cloud technology allows us to run our apps entirely in a web browser; no installations, just a URL. And, that's where we are today. We don't expect Google to be noisy neighbors, but they do tend to capture our attention. Not only does App Maker harness the power of the Cloud SQL platform but it also offers a tight integration with all of the G Suite tools. One of the killer features of this platform is its seamless integration with the rest of Google's suite of business tools including Gmail, Calendar, Drive, Analytics and even YouTube. Anyone can create apps that range from tracking expenses for a big sales event to creating a self-service interface for employees to manage their HR information and everything in between. 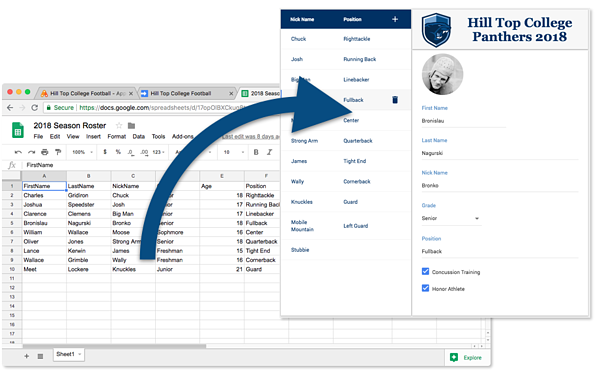 If you have 45 minutes or so, you can turn a Google Sheet into an app which you can then share with all or some of the users in your domain. We are excited to meet Google App Maker and look forward to learning new ways to create productive work applications. As we do, we'll post our insights about the tool's capabilities and functionality as well as share some helpful techniques and demos. Join our mailing list to keep up with the latest news and information about custom app development tools.